An early photo of Jack Erskine taken in the 1970s by legendary fishing photographer Ossie Emery. An iconic image of tackle genius Jack Erskine taken in the 1970s by Ossie Emery. AS Fishing World sadly reported earlier this week, world renowned fishing tackle guru and local angling legend Jack Erskine has died while visiting the US. Jack Erskine was acclaimed as an engineering genius who from humble beginnings went on to become respected the world over for his ability to modify tackle to perform well beyond original design limitations. In the process, basic fishing equipment became transformed into reliable fishing tools that helped anglers catch fish like never before. Erskine's angling ability too, according to those lucky enough to share a boat with him, was innovative and game changing. Though small in stature, he earnt a reputation for an uncanny ability to tame large fish in quick time. He also played a large part in forming the Australian National Sportfishing Association (ANSA) and was recognised by the International Game Fishing Association as a Hall of Fame member for his contributions to game fishing. As a special tribute to the man who influenced the way many anglers the world over now fish we feature some evocative images of Jack Erskine snapped by legendary fishing photographer/film maker Ossie Emery in the early 1970s. Jack (foreground) trolling for tuna on Jervis Bay circa 1970 with late Fisho founder Ron Calcutt (top) and Bruce Emery. THE term "legend" would have to be one of the most overused words in the English language. However, Jack Erskine fitted the bill perfectly. His achievements in the world of fishing were incredible, in fact unrivalled in my opinion. But, aside from being a piscatorial genius he was one of the nicest blokes you could ever hope to meet. I feel privileged to have known him as a friend and can honestly say that I never heard a bad word said about him in my life, such is the respect he was held in by anglers worldwide. When Fisho Editor Jim Harnwell rang me with the news of Jack's passing I was tremendously saddened, but I knew that Jack had been battling health problems for quite a while. The last time I talked to him about a month ago he had just gotten out of hospital again. But, even though he wasn't well, this incredible man wanted to talk about fishing and how I was going. Jack had been a wonderful friend and mentor to me and I will truly miss his wise counsel and encouragement. My fondest memory of Jack Erskine goes back quite a few years to when we were fly fishing together with Rod Harrison for billfish with Captain Paul Whelan aboard Devil's Pride at Port Stephens. I had the good fortune to hook a black marlin around 120kgs on fly and after I'd fought it for a couple of hours and we'd tagged it, we realised it was a potential world record. Almost instantly there was Jack with the biggest fixed gaff he could find in hand at the gunwale next to our deckie Chris "Sharkie" Miles. My first thoughts were "Oh my god, I'll be lynched if Jack Erskine gets pulled over the side by this fish". But, that was Jack Erskine, he was always there for a friend, he always wanted to be a part of the action and he was willing to do the hard jobs that those of lesser character would shirk. To me, Jack Erskine was Australian sport fishing. He was a key figure in the formation of the Australian National Sportfishing Association and was there right from the beginning of the land based game scene at Devil's Gorge during those halcyon days of the 1960s high speed spinning boom with Lyn Donohue, Ron Calcutt, Tom Nairne and Bill Gordon. His contributions to game fishing and in particular the development of the Cairns giant black marlin fishery are legendary. When it came to the world of fishing he did it all. From billfish on fly to Papuan black bass, Atlantic tarpon and huge impoundment barra there was nothing he couldn't do. Coming from a similar mechanical trades background to Jack, it truly astounds me how he came from such humble beginnings to become recognised as one of the great reel and tackle designers in the world. For all the plaudits Jack has received for his amazing achievements in the world of fishing, he was an even better person. You couldn't ask for a better mate than Jack Erskine, a man who genuinely deserves to be remembered as a legend. Mark Williams is a highly experienced angler and has been a feature writer and Technical Editor for Fishing World magazine for many years. NO one in the world of sport and gamefishing was as well respected as Jack Erskine. For as long as I can remember he has been at the forefront of so many areas in the Australian sport and game fishing scene; from his game reel modifications rod building and his angling he had no peers - he was a pioneer in all departments. When you look at the development of the Cairns giant black marlin industry, the most famous big game destination in the world, it was Jack's expertise in the early days that kept tackle going and Jack's meticulous efforts to improve weak links that can be seen all over modern day fishing reels and gear today. You need a few years under your belt to understand this but it's fact - no one ever knew his stuff as well as Jack did. In my mind's eye right now I can clearly see Jack, his lifetime fishing mate George Campbell, Rod Harrison, Lefty Kreh and myself sitting under the shade on the verandah of my Arrjim Island fishing lodge in PNG. It must have been the early '90s. I was in awe of the company I was keeping and just how cool those dudes were. As we sat chilling out after a great morning's fishing a couple of sailfish swam past the beach, not 50 metres from where we were sitting. I am pretty sure I thought pretty hard about getting up and making a cast while Jack and the guys acknowledged the two sails as they cruised by, smiled at each other and continued on talking - cool as cucumbers! Every time I met with Jack subsequently, we both agreed it was a very special trip - not because of the great fishing but of the great company that was kept. I feel privileged to have been there and privileged to have known Jack. He will be sadly missed. Dean Butler is a world renowned angler, guide and fishing writer/photographer. AS a deckie in the Cairns black marlin fleet in the late '70s my favourite place to hang out when I wasn't fishing was Bransford's Tackle shop on the Cairns waterfront between the Marlin and Platypus jetties. The man behind the counter who always made you feel welcome was Jack Erskine. "Erko" was always willing to pass on his wealth of knowledge to anyone, there wasn't one ounce of "secret squirrel" in him. If we had a problem with a reel in the middle of a busy heavy tackle season Jack would work through the night to make sure it was fixed and on the float plane the next morning. Over the years, first as a deckie for Peter Wright and then as one of the new skippers in the Cairns fleet, Jack became my mentor and friend with much of what I learnt about tackle and gamefishing coming from him. There were plenty of days on the water during the Cairns light tackle tournaments and Dunk Island tournaments when I would watch jack always tinkering with knots and leaders and rigging bait. He was meticulous with tackle preparation and if everything wasn't 110 per cent it wasn't good enough. Thirty four years later and Jack's 110 per cent rule still lives with me and has ensured some great captures from many 1,000 pound plus black marlin to metre barramundi. Not only was Jack a skilled engineer but was one of the best anglers I have seen. To watch Jack drop back and hook sailfish and small black marlin was a joy, and a skill that is being lost since live baiting and spin reels have come into vogue for billfish. The support and advice Jack provided to me over the past three decades cannot be overstated. One of my proudest moments was to see Jack become one of the inaugural Cairns Black Marlin Hall of Fame inductees. Jack never asked for notoriety, he just did what he enjoyed doing and was respected around the globe for who he was, a humble man, a first class angler, a gifted engineer and friend to all. Laurie Wright is a highly experienced skipper in the Cairns heavy tackle marlin fleet. He has been the recipient of several IGFA awards, amongst others. IT'S not until the flame goes out that we realise how brightly some candles burn. In mourning Jack Erskine's passing we also celebrate his life. Born in the outback town of Bourke, Jack was also born to fish and fix reels. Irrespective of what he turned his hand to, Jack was destined to be noticed. He came out of his motor mechanic time as an automotive engineer who wouldn't have been out of place in the Bathurst pits with Brock or Moffat. From a workshop just behind the Wollongong Police Station, Jack did custom carburettor and extractor work for the local revheads. The cops and their pursuit cars joined the queue. Fishing won out over fast cars, and when Jack took a tackle trade job at Rockdale his exquisite rod making and capacity to take the lumps out of the pretty ordinary drags in the reels of the day, brought him to the notice of Fisho founder Ron Calcutt, then putting the mag together at his unit in the adjoining suburb of Kogarah. Calcutt quickly inducted Erko into an inner circle that included Vic McCristal, then writing in his prime and film maker/photographer Ossie Emery. Vic and Jack had, meantime, gotten heads together at Foxground, a bass location beside Broughton Creek. Their love child, the Australian National Sportfishing Association (ANSA) swept the length and breadth of the land in decades to follow. Another man of vision, George Bransford, then spotted Erskine. On shifting to Cairns from Kona on a hunch, the American marlin skipper boated (his deckhand was on the rod) the first thousand pound black marlin to be caught on the Great Barrier Reef. He could use a man like Erskine. From a dockside base, Bransford's Tackle, Jack began to rub shoulders with the high rollers the big blacks were bringing to town, a custom rod here, a drag job there. The remarkable thing about Jack Erskine is the reputation he built on third person credibility. For a man not having his own media profile but reliant on what others thought, said and wrote, Jack rose to be the most respected and influential identity ever to grace the sportfishing world, bass to billfish. And not only ours; there's no higher honour than to be inducted into the IGFA Hall of Fame. "....but I love him dearly." A good word from Erskine opened doors, here and overseas. Jack would have achieved world fame simply on the basis of his developmental work and innovation. Unlike the aero-space whizz who can design aeroplanes but cannot fly, Jack could. His trademark black belt rodwork was only matched by a technical expertise, and certainly not by today's crop of high stick talking heads. We shared a lot of boats - bass fishing in the Shoalhaven, black bass in some ongo-bongo PNG river, flyfishing for marlin and tangles with some pretty big tarpon. My life, to say nothing of rigging shortcuts and fight know-how, would otherwise be the poorer. Jack passed away in good spirits. In his sleep, in America - a land he loved. He'd been visiting his mate Johnny Morris, owner of Bass Pro Shops, an outfit that makes our tackle chains seem pissant. To pile sad upon sad, Jack was about to make the biggest splash yet on the downunder tackle scene. Condolences to Veronica, Suzanne, Robert and Daniel. He was our mate, too. 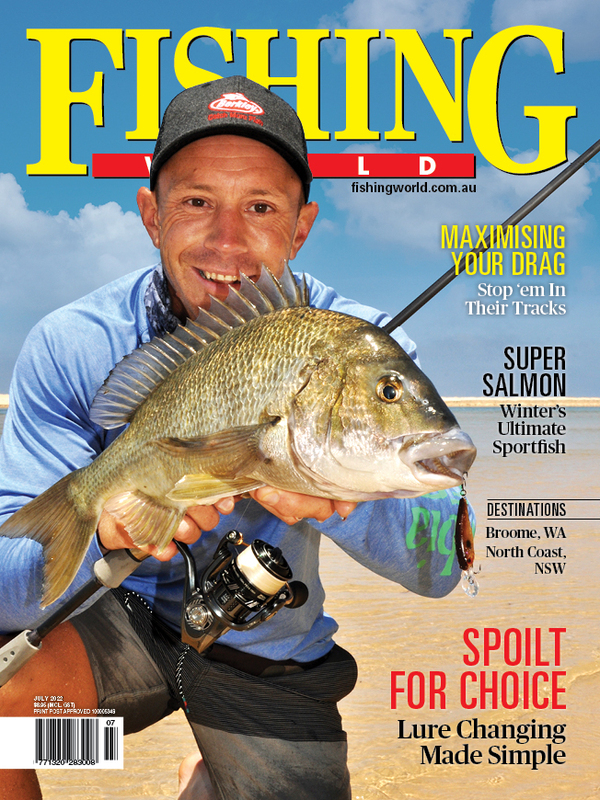 Rod "Harro" Harrison is one of Australia's most well known and respected fishing writers. SADLY we've lost Jack Erskine. He was a small man but a giant in all areas of sportfishing and there will never be another like him. There's no question in my mind he was the fastest talking person I've known and had he wanted to be an auctioneer he would have been at the top of the heap. Lucky for all of us who love fishing be it offshore, plug, fly or spinning Jack had an impact on so many of our lives. I recall in 1993 when Jack and Rod "Harro" Harrison were in their small boat on the Kulu river in New Guinea and I was stunned at how skilled Jack was with plug casting tackle. Then the little guy hooked and quickly landed a large GT on plug tackle - something men much bigger and stronger than he would have not done as well. A few days before Jack left us I was at the huge ICAST show - the world's largest display of general fishing tackle open only to dealers and the media. Peter Wright, considered one of the finest offshore skippers ever, stopped by and I mentioned that Jack would be coming to the show. Peter couldn't stay but he said, "Jack was one of just two people who were the best in the world at improving and fine tuning offshore reels," a tremendous compliment from one of the best. Jack and I shared coffee together at the show and he said he was in process of making me a special fly reel - I was touched. I learned so much from Jack about reels and mainly about life and I will miss him so. He was one of the best friends that ever happened to me. Lefty Kreh is a world renowned fly fisherman, photographer, writer and instructor and a pioneer of saltwater fly fishing. IT is with a heavy heart that all at Jarvis Walker Brands farewell Jack Erskine. Jack's sudden passing has shocked and saddened all the staff at JarvisWalker Brands. Jack first started working with us in 1995 and his counsel, ideas, dedication and friendship throughout our long association has been a valuable contribution to our company'ssuccess. Jack worked with us as a consultant from 1998 and in that time he was instrumental in the development of many Jarvis Walker Brands products, as well as having a significant influence on the servicing practices employed at Anglers' Central Service Centre. Jack's technical knowledge of fishing equipment and how to make it better is unequalled. His prowess as a fisherman and a clever engineer were a unique combination that made him a sought-after tackle consultant, at an international level, and a credit to the Australian fishing tackle industry. His vast achievements were duly recognised when he was inducted into the IGFA Hall of Fame. Millions of anglers around the world benefit from Jack's expertise each time they cast, without necessarily knowing of the input Jack had in the development of the reels they are winding. Jack's ingenuity, aptitude for clever ideas and dedication to recreational fishing were evident in everything he did, from pioneering the Cairns marlin game fishery, to landing multiple world records, to building the enviable reputation of his Jack Erskine Precision Reel Engineering business. Jackwill be missed as a fishing tackle luminary, an elite angler and a mate. All the team at Jarvis Walker send our condolences to Jack's wife Veronica and family during this difficult time. THE name Jack Erskine is associated with many varied and revolutionary events in the world of sport and game fishing. He was viewed more like "the Godfather" by his peers and friends. Taking people, often strangers, under his wing, encouraging and enthusing them to be the best they could be and selflessly spending plenty of time to help them climb to their potential heights - I thank Jack for doing just that with me for many years. As an engineer Jack was a wizard, and if a particular tool wasn't available to do the intricate work he undertook with his world renowned business Jack Erskine's Precision Reel Engineering, he would make the necessary tool himself, absolutely flawlessly. His workshop was his palace and important tools were wrapped in oil dampened rags to keep them in new condition. The man was a genius, plain and simple, and took pride in his work. Almost every quality brand name in the world has at some stage called on Jack to solve a problem or help them improve their products. Something many people don't know is that Jack was an amazing rod designer also, and his early designs are still being replicated today, just not with the credit going to Jack, that's all. Jack was honoured to be inducted into the World Fishing Hall of Fame in the US in 2009, and this achievement on its own is testament to his global achievements. When just a young boy, a childhood accident was the beginning of a long list of health issues that plagued Jack and on regular occasions he was slowed down by agonising migraines. Each and every time I spoke to Jack, it was impossible to tell how his health was going just by looking at him, or listening to his voice on the phone, but for those who knew him well the expression "I'm fine mate" was never a totally honest statement. It was the only time that he wasn't telling the truth, and honesty was just one of the traits that we all knew made Jack unique in this world. If Jack shook hands with someone to signify a deal or commitment, you could bet your house that he would deliver the goods, no matter what the cost. Sadly, this old school morality is all but lost amongst many modern day business people, and this did lead to Jack being taken advantage of many times. Somehow he managed to bounce back and still find it somewhere in his heart to risk trusting again. Jack, in America for advisory talks with his long time close friend Johnny Morris, owner of the Bass Pro shops in the US, was about to announce the launch of a string of specialty shops that would be sure to become a benchmark in this country. With the Goliath-like backing of someone of Mr Morris's stature in the tackle industry, combined with the loyalty of someone Jack knew as a close friend that shared a very special bond, all of Jack's hard work, bad luck and kind heartedness would finally be made worth the effort and determination. Jack had more of a reason to complain than anyone could imagine, it just wasn't in his nature to put his problems onto others, no matter how much that person wanted to help. Veronica, Jack's loving wife provided the only true indication I could get on how Jack was going with his health issues - he was all the while playing it down. To list all the health issues that Jack endured would be to waste a very short space I have here on a negative aspect of his life when there were so many amazing qualities to, and achievements by this great man. Anyone who fished with Jack will tell you it was always a day filled with stories of fishing experiences from around the world littered with lessons on fishing, talking tackle and life in general. When that bite eventually came it was a matter of sitting back and watching a master at work. Jack's rod angles, body posture, and the ability to unbalance and out think a fish was just amazing to watch. Jack's early days were made up of big game fishing and spinning from the rocks, but he also spent a lot of time in his early years around Bourke. Apart from fishing, one of Jack's other passions was old motorbikes and he was looking forward to tinkering on something else than reels. Jack's son Daniel will carry on Jack Erskine's Precision Reel Engineering; having been trained by the master is sure to do his father proud and be kept incredibly busy. It will always fill me with pride, love and respect to have met and got to know a man who had to be known to be truly understood and appreciated. Jack was loved by many and had an extended family of people he touched throughout his life. My most sincere condolences go out to not only his many friends, but even more so to Jack's dearly loved wife Veronica, sons Rob and Daniel and daughters Suzanne and Tina and his grandchildren Cameron, Brayden, Jake, Jye and Kohen. Funnily enough Jack's new business name was JEDI, ha ha ha, which actually stands for Jack Erskine Development International, which leaves room for so many one-liners that would make Jack smile. I believe that every single person that was touched by Jack is a better person just from the experience. A big part of my life and many others lives is now missing, but our hearts will be filled with fond memories of the times we shared. David Hodge is a highly experienced fresh and saltwater angler and gifted caster who regularly gives demonstrations at boating and fishing events around the country.